Proposed rescue helicopter for USAF based on K-1125 with two PT6A turboshafts, streamlined fuselage and large tail fin. Not built. The Huskie III underwent evaluations for two years, but never gained acceptance by the Air Force. Undaunted, Kaman tried again; this time with a proposal in February 1969 for an improved LBR helicopter to supplement the HH-43 inventory. Kaman also advertised the type as an armed troop transport for counterinsurgency (COIN) operations. Called the K-700, the aircraft fared even less favorably than the Huskie III, barely proceeding beyond the drawing board. Intended as the ultimate H-43 design, the K-700's power would be derived from twin T-400-CP-400 turbo engines driv-ing the familiar intermeshing rotor blades. A stretched fuse-lage of nearly 12.5m would accommodate 14 passengers. 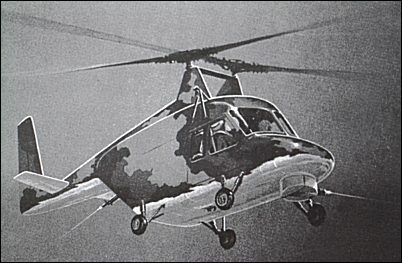 Somewhat similar to the earlier proposed Huskie III, the K-700 was to have wheel landing gear, a "Vee" bullet-resistant windshield, self-sealing fuel tanks, provisions for external or internal auxiliary tanks, and an awesome array of armament, putting it on equal footing with contemporary gunships. A vast assortment of features and options, too numerous to list, plus a guarantee by Kaman to deliver the first aircraft within 20 months, did not persuade the Air Force to purchase the K-700.